Current Freeride Mountain Bike world champion Emil Johansson (SWE) put down six never before landed tricks during the Suzuki Nine Knights MTB Contest, at Reschenpass in South Tyrol, Italy, to win the Slopestyle Bike category. In the last 25 minutes of a 99-minute jam format contest, Johansson landed an array of new flip combinations to beat Italian Diego Caversazi, whose Frontflip Superman and Cash Roll on the Sendolf Kicker earned him second place. As Diego and Emil pushed each other and the possibilities of technical Slopestyle biking to the extreme, most other athletes decided to participate in the Downhill / Big Bike Category. 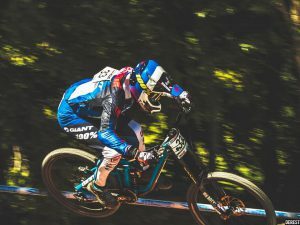 Meanwhile, Brit Sam Reynolds, who served as course designer for the last two editions, took first place in the downhill bike category, besting Nico Scholze (GER) and Clemens Kaudela (AUT). Reynolds performed a “Flintstone” and a “Superseat” on the Sendolf Kicker with his Big Bike, sent a massive Quarterpipe air, and sped down the huge Big Bertha line in style. “It feels great to win the contest,” explains Reynolds, “but, as course builder, I’m especially happy that it went well and that everyone enjoyed it. The week at Suzuki Nine Knights is always special; we ride together, we’re not competing but working together to make amazing videos and photos.” Following close in second place, Nico Scholze put down a “Flatspin Nac” and a “Tsunami Backflip” on the Sendolf, as well as a huge “Backflip Heel Clicker” on the Big Bertha kicker. Clemens Kaudela’s Big Bertha Line combos, a “Flip Tuck No Hander”, not to mention a huge Quarterpipe air helped earn the Austrian course builder a well-deserved third place.